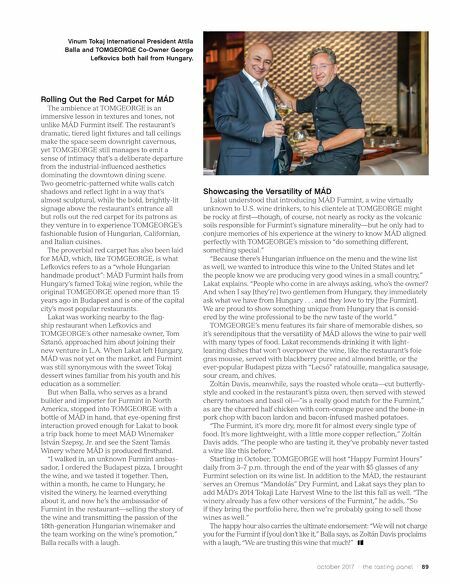 88 / the tasting panel / october 2017 A fter traversing the Atlantic on a mission to take American wine drinkers by storm, MÁD Furmint from the Tokaj region of Hungary has landed at TOMGEORGE restaurant in Downtown Los Angeles. Almost every piece of the restaurant's meticulously- constructed design—from its wood-and-brass detailing down to its '60s lounge–esque leather seats—was shipped in from co-owner George Lefkovics' native Hungary, so it seems only fit- ting it's shipping in the country's groundbreak- ing new dry expression of the iconic grape from the Mád village as well. The Tasting Panel joined Lefkovics, Vinum Tokaj International President Attila Balla, TOMGEORGE General Manager/impromptu MÁD ambassador Les Lakat, and Manager Ken Zoltán Davis to discuss how the addition of MÁD Furmint to TOMGEORGE's worldly wine list is yet another indelible expression of its contemporary European style. 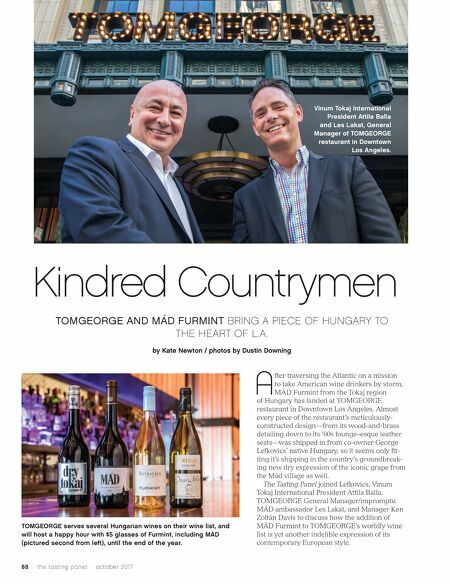 Kindred Countrymen TOMGEORGE AND MÁD FURMINT BRING A PIECE OF HUNGARY TO THE HEART OF L.A. by Kate Newton / photos by Dustin Downing TOMGEORGE serves several Hungarian wines on their wine list, and will host a happy hour with $5 glasses of Furmint, including MÁD (pictured second from left), until the end of the year. Vinum Tokaj International President Attila Balla and Les Lakat, General Manager of TOMGEORGE restaurant in Downtown Los Angeles.